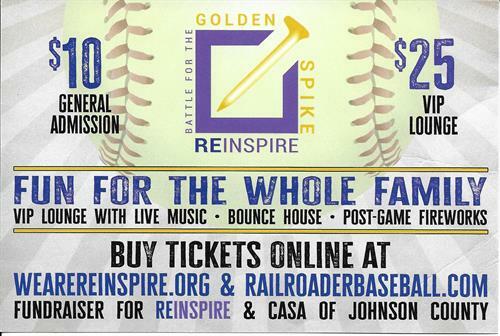 As the Major League Baseball teams begin gearing up for their season, the cities of Cleburne and Burleson are also prepping for an important game, ReInspire's Battle for the Golden Spike scheduled for Saturday, April 6. Mayor Scott Cain of Cleburne and Mayor Ken Shetter of Burleson will recruit and manage their teams in a 7-inning softball game at The Depot in Cleburne. The charity game benefits ReInspire and CASA of Johnson County. The mayors' rosters will be filled with first responders, veterans, business, faith and local community leaders including students and education professionals. Players from the minor league Railroaders will also support each team. "The winning city gets custody of the trophy until the next game and, of course, bragging rights, " said Charise Olson, executive director for ReInspire. Organizers will also be counting which city turns out the highest number of fans. "There may be some other stakes agreed to between the mayors, but that's out of our jurisdiction," Olson added. A special kids' area, generous raffle, VIP Lounge and mid-inning entertainment will round out game night. Game time is at 6:05pm, gates open at 5:00pm. General admission tickets are $10.00 and a VIP Ticket is $25.00. All proceeds benefit ReInspire and CASA of Johnson County. Tickets can be purchased via WeAreReInspire.org. VIP tickets are on a first come basis and only available through March 30. Event Sponsorships are also still available. "We're excited to offer a fun evening for the community and raise support for ReInspire and CASA. Fundraisers like this help us help more kids," said Olson. ReInspire serves current and former foster youth aged 12-23 with supportive services and programs focused on restoring hope and building confidence in their successful future. CASA of Johnson County pairs trained advocates with children in foster care. Advocates are the voice for neglected and abused children in court proceedings and in the community. Special support for the event is provided by The Cleburne Railroaders.